We were all blown away with the success of the Arduino/TV-B-Gone workshop presented by Mitch Altman as part of his Hackers on a Train 2012 tour. Tom's been working on a dc power supply using parts from his junk box. I really enjoyed the aesthetic of this project. He had a few that he was finishing up at the last open hack. 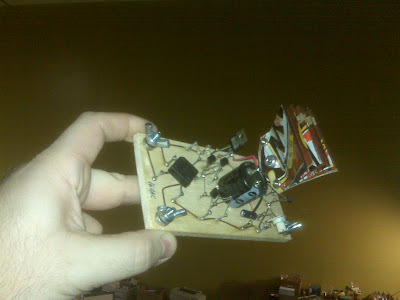 He cut up a can of root beer to create a heat sink, used a board and nails to wire up the connections between the components and wing nuts for good solid connections for both power in and power out. This project reminded me of an episode of Collin's Lab which looked back to the history of the breadboard a bit. Collin used a real wooden breadboard and nails much like Tom did. The method is basically the same and results in a simple, but custom prototyping space that has a lot of character and can be more permanent than a typical breadboard. In any case, it is a nice little idea to stick in your back pocket. We played around with the idea of using this project as a workshop project to help teach a few things about electronics. If there is some interest we'll explore that more fully.